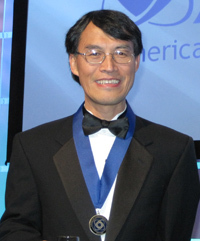 Carnegie CDAC-Affiliated Scientist Yingwei Fei was elected a Fellow of the American Geophysical Union in January and received his award during the Fall AGU meeting on December 15, 2010. The honor is given to those who have attained "acknowledged eminence in the Earth and space sciences." Only one in each thousand members is elected to Fellowship each year.